My education and work experience has been as a graphic designer and also as an instructor of both graphic design and desktop publishing. I enjoy doing other artwork—watercolor painting, photography, mixed media and pressed flowers—but it’s the quilts that I’m compelled to work on. Sometimes I get an idea like a flash and other times the fabrics tell me what they want to be. What interests me about traditional quilting is how a quilt square can look completely different if the shapes that make up the square are in different colors or tones of the fabric. 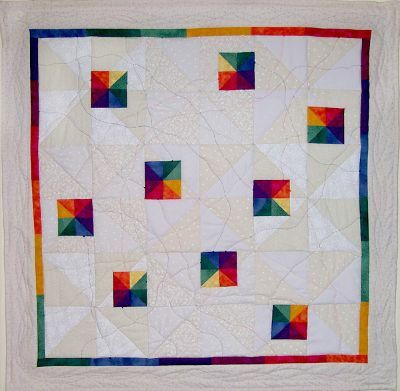 I am also interested in the secondary patterns that emerge when quilt blocks are arranged together. After making many quilts for myself and for friends and family, I decided to create some of my own designs, both in a traditional quilting style and also as art quilts.